I’ve made an effort to see a few things that I didn’t do when I lived in Cambridge. So before I get into the Beer Festival here’s a couple of things I did when I wasn’t taking advantage of Andrew’s washing machine, tv and couch. Despite the fact that this is one of Cambridge’s most iconic buildings I didn’t even consider going in until one of my co-workers, Tim, came here a few years ago and I saw pictures of the inside. It’s £9 to have a wander around. There are side rooms with informative displays but the main attraction is the long room and it’s astonishing fan ceiling. The big dark thing in the middle of the first photo is an oak room divider that was donated by Henry VIII. I think it’s awful but my opinion seems to be in the minority. It houses the pipe organ and keeps the riff raff in the back half of the chapel out of sight. When visiting these kinds of edifices it always pays to look for amusement in the small details. This guy looks like the textbook definition of ‘chief executor’. Or possibly ‘grand vizier’ . I wandered down here before our first Beer Festival session. Beautiful. The gardens were much bigger than I expected and full of students, draped like cats over every available sunny bench and table. The gardens have lots of ‘rooms’, as well as actual rooms in glasshouses. All are well-labeled and interesting. The chronological bed was a concept I’d never seen in any other gardens. I had two favourite parts to the gardens. The first was the lovely scented garden, which is a bit hard to share on a blog page. The second was the way that grass/meadow plants had been left to grow into islands and borders around perfectly manicured lawns. The contrast of soft meadow and smooth green was delightful. Also difficult to really convey in photos but you’ll just have to trust me. I sat for a while and read my book – Great Expectations. If anyone had told me how funny Charles Dickens was I would’ve read it years ago. Although perhaps I wouldn’t have appreciated it then? Who knows. One of the longest-running beer festivals in the UK (and probably the world.. outside Germany maybe?) it is put on by CAMRA, the Campaign for Real Ale society, who are a group that works hard to promote small scale brewers and keep traditional English Pubs out of the hands of criminals who gut the insides and replace all the dark wood with IKEA pine board or worse – turn them into offices. The Cambridge Beer Festival is no small deal. It runs for six days, two sessions a day (12-3 then 5-11) and costs £3 to get in (per session), unless you’re a CAMRA member, which costs £20 per year and gives free entry to all their events. I attenedd the festival with Andrew, who is thrilled to have my company. This year we’re here on Tuesday evening and then both sessions Wednesday as I’m off to Belfast on Thursday. I decided to approach my cider and perry choices this year (beer is revolting) in the same way I choose horses at the races – amusing names. So far I’ve had ciders called ‘Virgin on the Ridiculous’, ‘Weasel’s Wevenge’ and ‘Monk and Disorderly’. I also tried one called ‘Ghandi’s Flip Flop’ but it was revolting. Of course it’s not all about drinking. There’s an outstanding cheese counter too. And don’t forget the pork pies. 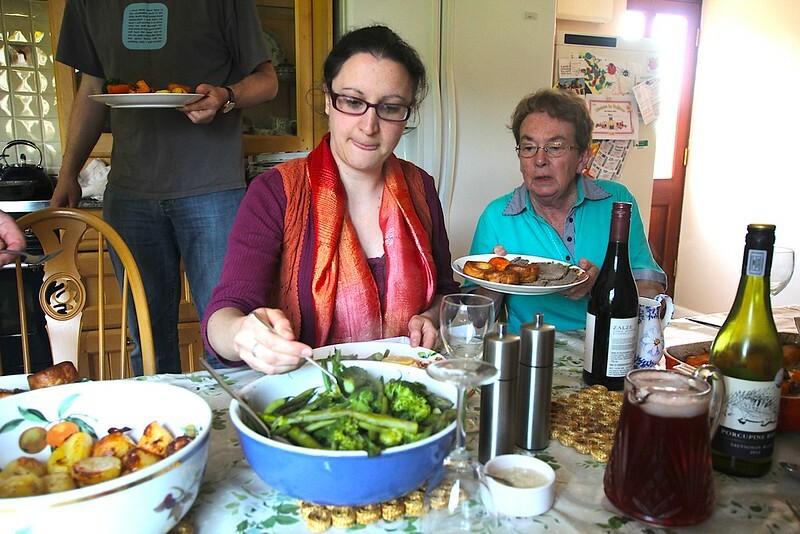 There’s also terrific curries, roasts and fish and chips. 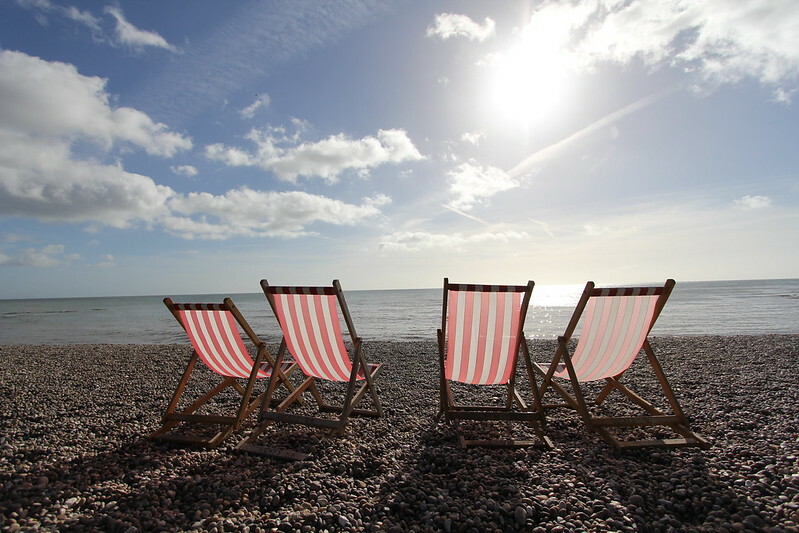 Could anything be more British? We were even first in line on Wednesday – and what a line it was. If you’re ever in Cambridge at the end of May, and particularly when the sun is shining, I highly recommend going, it’s a great day (or six) out. Travel can’t always be sunshine and uncomfortable beaches. We’ve returned to Cambridge and are having a quiet week. I’m teaching myself to crochet, with surprisingly swift success thanks to YouTube tutorials and enough time to actually focus on it without distractions. 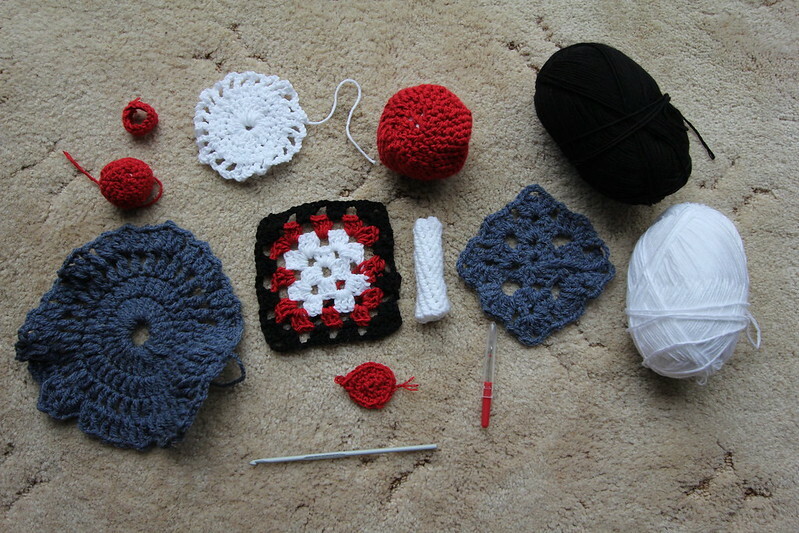 I’ve made a rectangle, circles, a square, a ball, and a tube and I’ve been experimenting with different combinations of stitches to make a range of shapes. Although travel is challenging on organisational levels I haven’t acquired a new skill in quite a long time. It’s been a very enjoyable exercise for my brain and it’s also a craft project I can take on a plane, which makes it far more convenient than knitting needles, which everyone knows are the tools of crafty terrorists (boom tish!). I’ve been annoying people by posting photos of my crocheting on facebook, but since Mum doesn’t use facebook some people are just going to have to admire them twice. They’re not perfect, but I couldn’t even do a single crochet stitch three days ago so not a bad effort! Right now I’m just working on technique and getting my stitches all an even size, but I’m aiming to make a blanket out of squares and some amigurumi dolls. Luke is sporadically working on videos, we’re both watching lots of Star Trek: The Next Generation (brought on by reading Wil Wheaton’s autobiography and we’re enjoying it enormously) and I’ve been drinking tea and enjoying it for the first time in my whole 37 years. Up to three cups a day! What with the crochet I think I might buy myself a rocking chair when I get home and be done. Luke spends some time with his relatives in Dedham, visiting Flatford Mill and “Constable country”, where the painter John Constable created most of his famous works. He also attends the “Strawberry Fair” festival in Cambridge with Andrew. Also, is there any food that comes on a stick which ISN’T awesome? We have yet to find any. 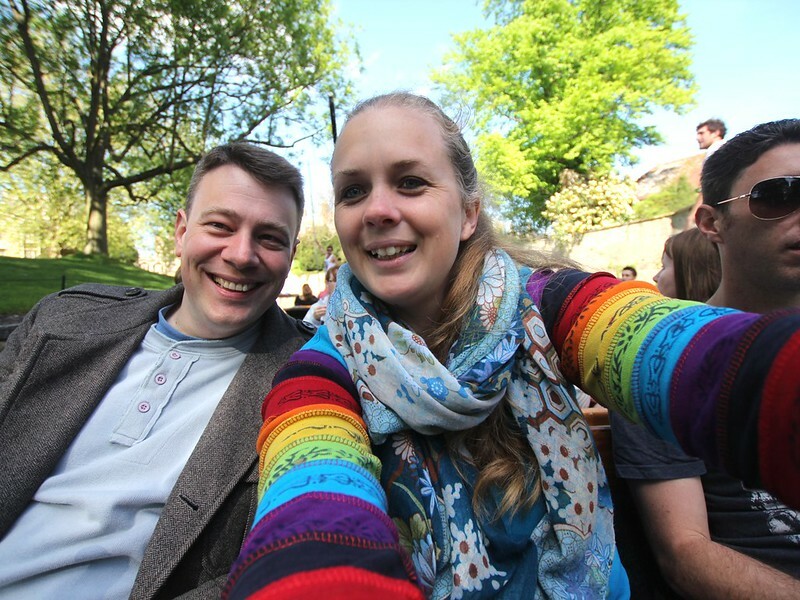 We meet up with friends Leigh, Nikki and Jen for fun times at the Cambridge beer and cider festival and a great afternoon punt down the river Cam. Andrew’s parents invite us over for lunch, and Ferris the dog gives us a run for our money. 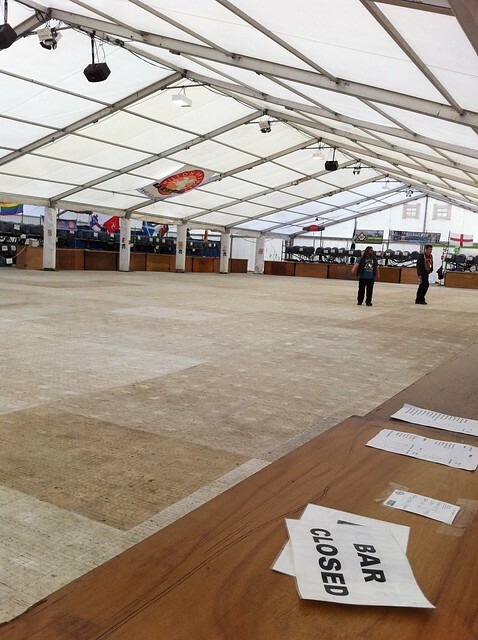 We get back to Cambridge in time to volunteer at the 40th CAMRA beer festival! Well, TRY to volunteer. Andrew and I sample some pints, Amanda discovers the wonderful world of mead, and all of us stuff our faces full of food. 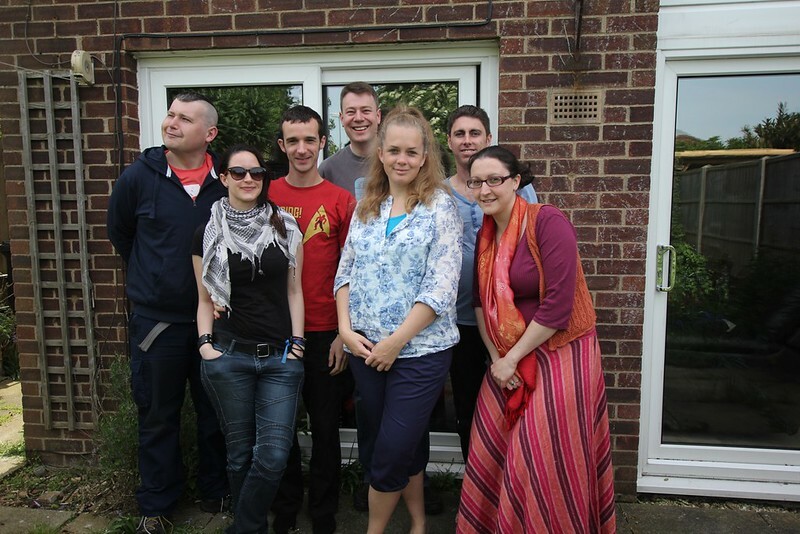 This past week has all been leading up to the big weekend of the CBF and Leigh and Nikki visiting from Edinburgh. I managed to rope Jen in at the last moment and Matt made it down too, so add to that two days of blazing sunshine we ended up having an absolutely brilliant weekend. Nikki and Leigh arrived first. Luke and I picked them up from Stansted on Friday and took them back to Bar Hill briefly before catching a taxi into town to maximise our festival attendance. The festival was absolutely rammed with people and everyone was indoors due to the evening being freezing and wet. We ate, talked and jostled for space until it was 10:30 and we were all kicked out. We repaired back to Andrew’s for much drinking and talking. The most difficult way to drink. There’s something very cathartic about talking to people (and I’ll be honest, a girl) from home. Nikki and I drifted off to the kitchen, then the bedroom, then back to the loungeroom in a night of epic conversations and catching up. A lot of drinking took place too, which meant a rather slow start the next morning. I ended up asking Jen to catch a taxi from the station while I dealt with my headache (and felt monumentally guilty) then, mostly recovered, we all headed into town to make the most of the afternoon in the best way possible. 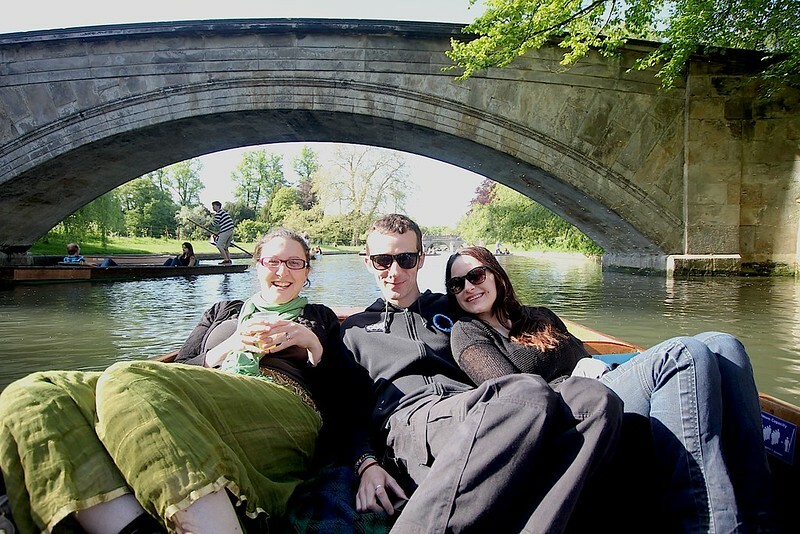 Punting on the Cam – a classic Cambridge experience. Normally I think photos make events look more pleasant than they often are. This afternoon was not one of those times. It was gorgeous, just as pretty as I remembered, though it was a shame we missed out on hiring a punt and doing it ourselves. We had a good laugh at some guys who’d punted themselves into a willow tree and couldn’t get out but were shouting out to everyone going past that it was completely intentional. Next was the final day of the festival. The ground had dried out enough to sit on and then eventually we got a table and drank and chatted until the sun went down and the cold started to seep in. Back at Andrew’s Matt had just arrived and we stayed up for a while eating pizza and sharing youtube clips but we were all rather tired and couldn’t manage another huge night. Pancakes for breakfast the next morning before waving off Matt, Leigh and Nikki. Jen joined Andrew, Mum, Luke and I in a trip to Colchester to have an enormous and delicious roast lunch at Andrew’s parents’ place. It certainly brought back memories – I used to go back every Sunday with Andrew when I lived there and we’d gorge ourselves on the amazing food then lie on the couches all afternoon. We sat in the sun after lunch and played with Ferris, the family dog. It was just so nice. If I could be guaranteed weather, food and (most of all) company this good every weekend I’d leave Australia in a second. I love a warm day and a cold night. It’s just a shame there’s so few of them here. We left Luke at his uncle Mark’s place – coincidentally Mark lives about 5 minutes away from Andrew’s parents – and drove back to Cambridge. A quiet evening watching ‘Bridesmaids’ with Jen and Andrew before a relatively early night in preparation for the big drive the next day. 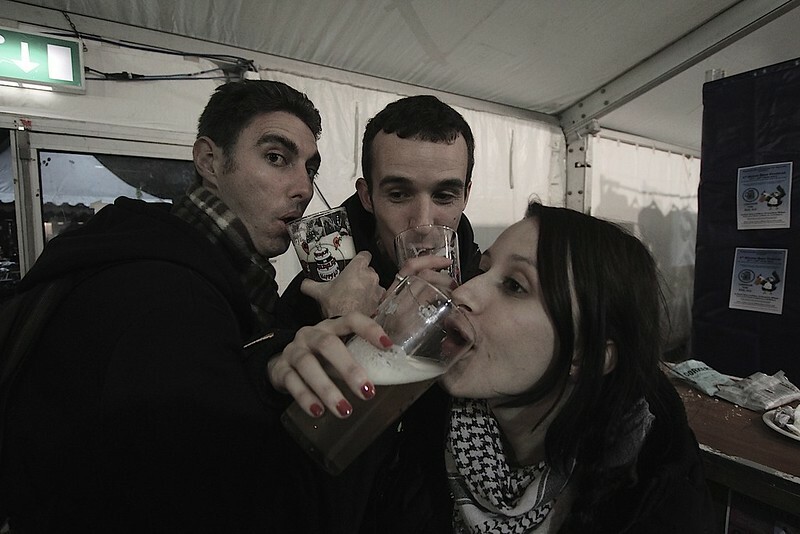 Cambridge Beer Festival.. this time with pictures! After 2 days of loitering around and getting in for free, yesterday Luke and I finally got some work at the beer festival – and work we did. We started at about 2pm and worked through til nearly 10pm. 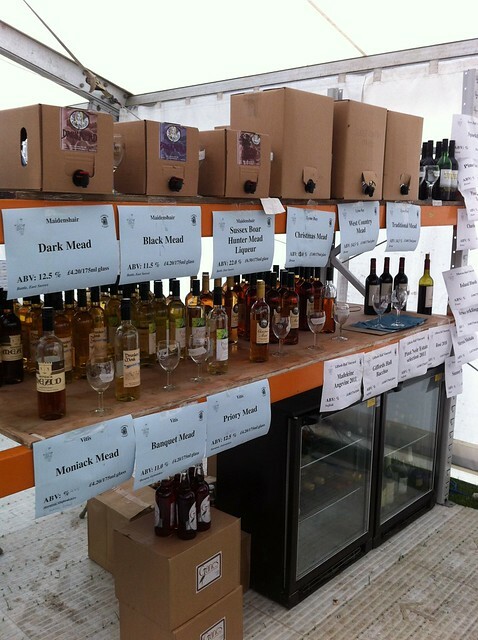 We started off on the mead and wine counter, then did some glass washing, then when the festival reopened at 5 we were back to the mead counter but then Luke was taken away to serve beer after a bit. The indoor area before opening. Over 200 ales on tap. I had a great time with my lovely manager (actually the deputy but the real manager never showed up while I was there) Jo who was really friendly and thoughtful and organised. At the end of the night I told her what a great manager she’d been and she looked shocked ‘Really? What did I do?’ but it’s hard to put into words just how good it is working for someone who isn’t a raging ego maniac, a control-freak micro-manager or useless hippy – like half the people I’ve worked for at Rainbow (an Australian festival). Working on the mead counter was very enjoyable. My knowledge of mead has gone from zero to better-than-most in one day. I tried nearly all the meads we sold. They ranged from very light to dark and there was a Christmas mead, which tasted exactly like Christmas, if Christmas was made of honey. 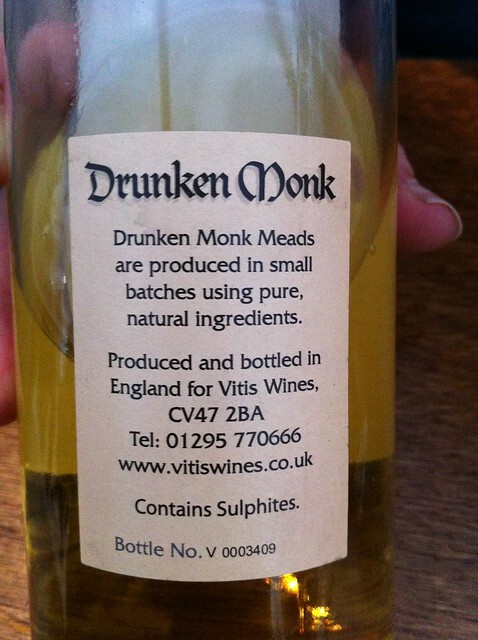 There was also a blackcurrant mead, which wasn’t bad. We also sold perhaps 10 wines, all made in the UK. I didn’t even know wines could be made in this sort of climate. The mead selection with the tiny wine (all English) fridges below. Uncorking wine was my least favourite job. I think our stall was different to most, in that nearly everyone who came up hadn’t tried mead before and wanted advice. This was a bit daunting as I didn’t know anything, but all people really want is to try a couple and decide for themselves. Quite a lot of people were shocked or disgusted by how sweet it is and made funny faces, particularly a group of Japanese people. 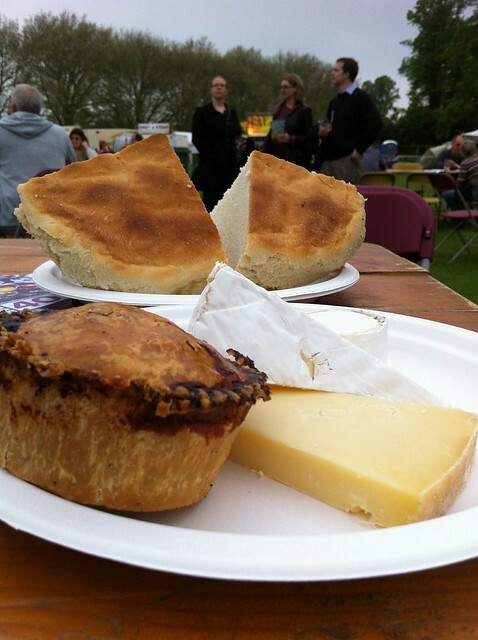 A pork pie and a cheese plate. There was a terrific selection of cheeses – sadly not all were put out simultaneously. I’m still waiting to try a scotch egg. Toni – tried a Wensleydale with cranberries. Delicious! I’ve saved up my tokens that we get for working and bought a few more in order to acquire a couple of bottles of mead for myself. I think there’ll be one to send home (at least!) and one to have here when a bunch of us get together in Edinburgh in July.